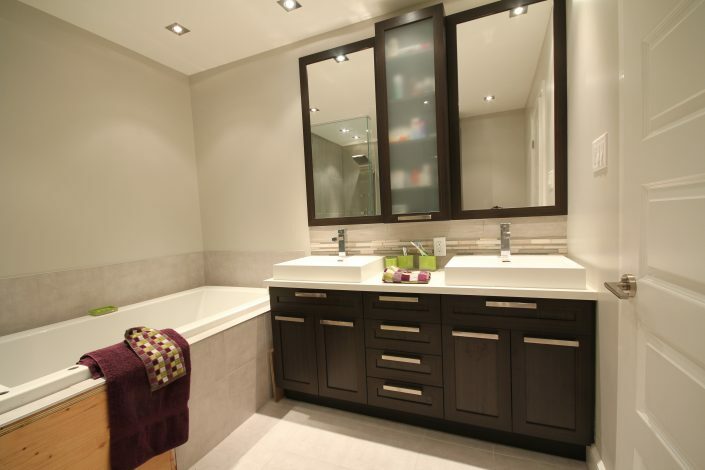 Discover this superb bathroom renovation project in a house in Notre-Dame-de-Grâce. 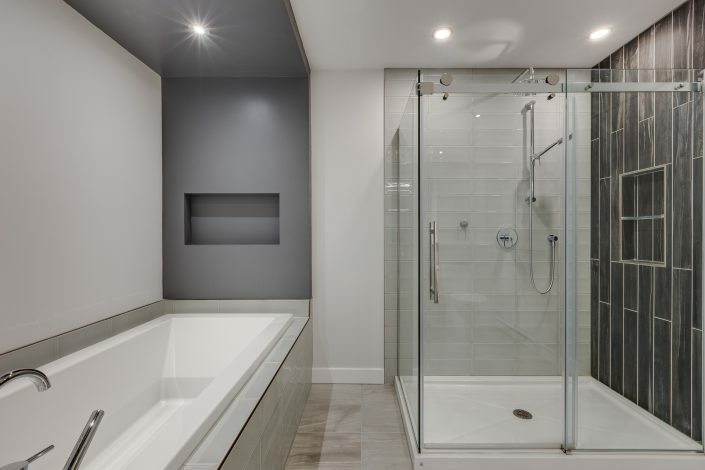 You too can benefit from our expertise as a general contractor specializing in bathroom renovations, in addition to our turnkey renovation services. Call us for a free consultation! The bathroom is one of the most common rooms used in a home; it is important to make it a pleasant and functional place. In this project, our client wanted to transform his bathroom into a haven of peace, with a touch of Zen style and lots of light. The first step was to partially demolish the bathroom. We first removed the split and broken ceramic floor in several places. Our team then completely dismantled the shower and bathtub, as well as the cabinets and vanity. We opted for a grey ceramic floor, which could easily be combined with the style proposed by our client. 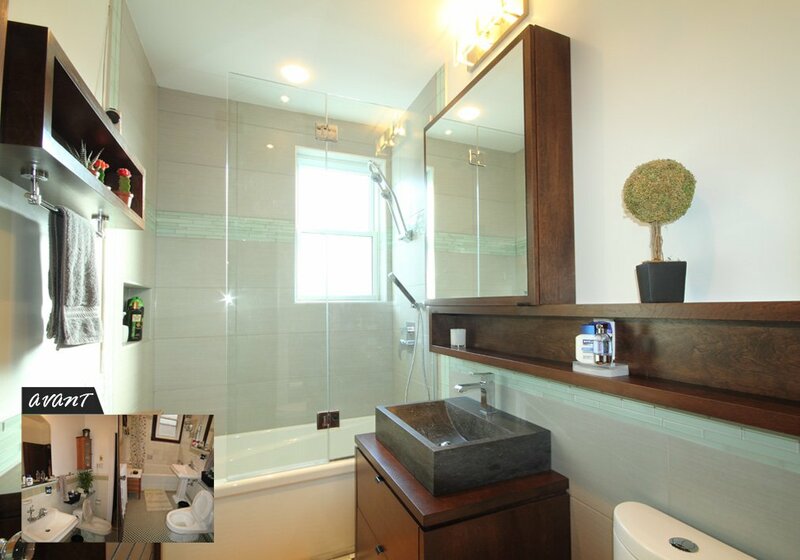 We have also added a shower combined with the bathtub, with telephone shower and glass doors. The walls are made of ceramic with an insertion of small pieces of light green ceramic. Considering the small size of the bathroom, the client chose a simple vanity unit with melamine cabinets in a wood finish. We chose a basin type sink (which is outside the vanity) made of dark natural stone. This custom bathroom vanity is topped by a double medicine cabinet with mirror and a rectangular shelf. As a final touch, we integrated a bathroom backsplash with grey ceramic tiles and an insertion of light green ceramic pieces. Another wooden-finished melamine shelf has been added on the left wall of the bathroom. 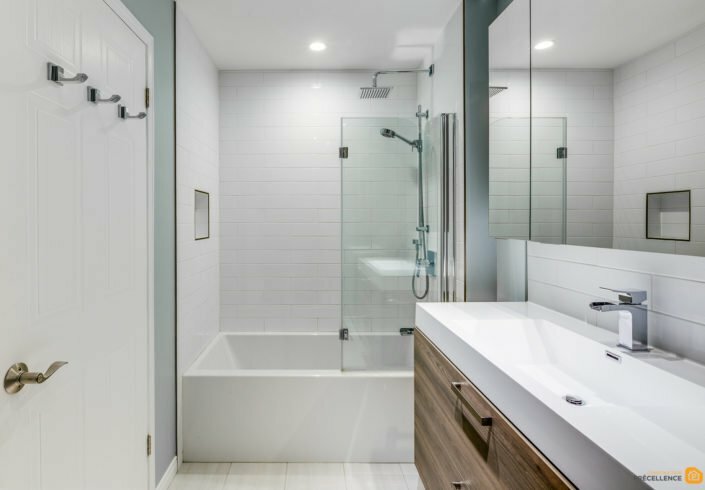 As a general contractor specializing in bathroom renovation, it is our duty to take charge of all the steps of your renovation project, whatever its size. To do this, we have established partnerships with bathroom cabinet and furniture manufacturers, floor covering specialists, designers and architects to ensure the success of each project. 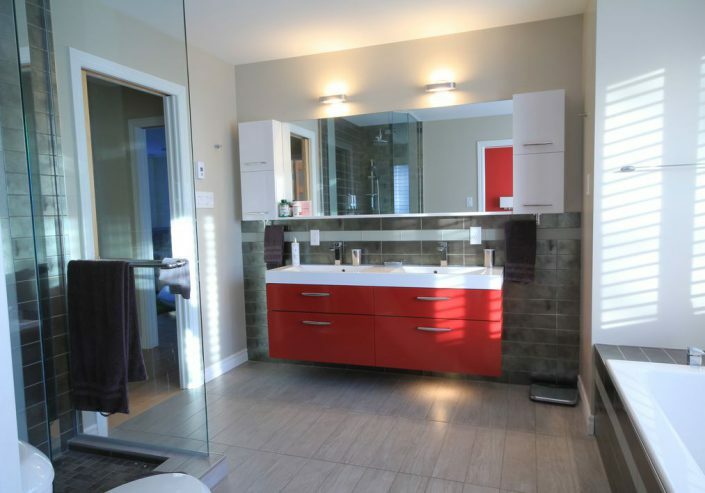 If you would like to know more about this bathroom renovation project in Notre-Dame-de-Grâce, our turnkey renovation services, our prices, or our other services, we invite you to contact us by email or by phone. Your first consultation is free of charge! Our team will be happy to welcome you and answer your questions.